WHERE IS THE AC JOINT? The AC joint is a small joint formed by the end of the clavicle (collar bone) and the acromion. The acromion is part of the scapula (shoulder blade), most of which is on the back but the acromion curves forwards, over the top of the shoulder joint and meets the clavicle at the front. The joint moves very little in comparison to the nearby shoulder joint but tremendous forces travel through it particularly in manual and overhead workers or sports people. 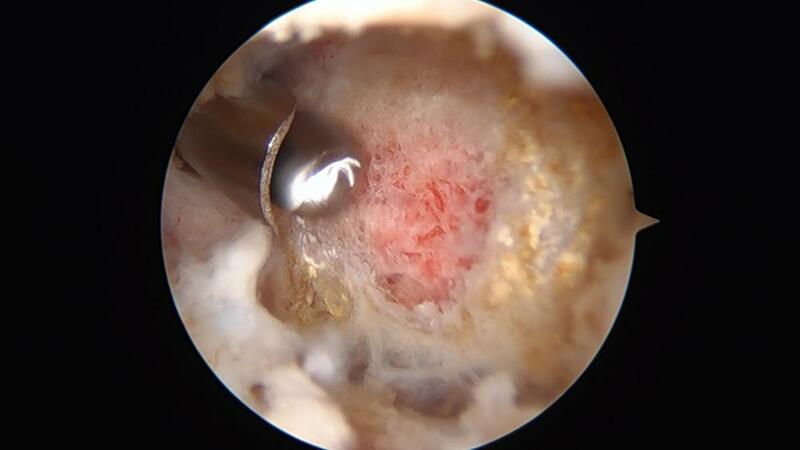 Inside the joint is a small cartilage disc which degenerates as we get older and may have disappeared by our 40s. There are ligaments and a capsule to keep the joint aligned. Like any joint, it is susceptible to wear and tear (arthritis). This can co-exist with Impingement symptoms but they are not really directly connected. As one gets older, the joint narrows and as a result many patients over the age of 50 can have X-ray evidence of arthritis here. That does not mean to say it causes pain though. Patients may complain of pain directly over the joint. Pain is generally worse on over-shoulder activity, lifting heavy items and sleeping on the affected side. Pain is often worse on bringing the arm across the chest as if you were putting your hand on your opposite shoulder. Pain localised over the AC joint which increases on direct pressure and pain in the AC joint when bringing your arm across your chest are signs that the AC joint is involved in your symptoms. An X-ray may show narrowing of the joint associated with other changes of arthritis such as osteophytes and erosion of the smooth joint surface. ACJ after subacromial decompression (co-planing) but before ACJ excision. Treatment commences with simple measures like rest, modification of activity and painkillers and anti-inflammatories. Physiotherapy may help but is unlikely to be of lasting benefit. An injection of local anaesthetic and steroid is often beneficial to reduce pain. This may be enough to settle your symptoms completely but often the sypmtoms return some weeks or months later. The injection was however still helpful in that, if it relieved your pain, it confirms the source for further treatment. 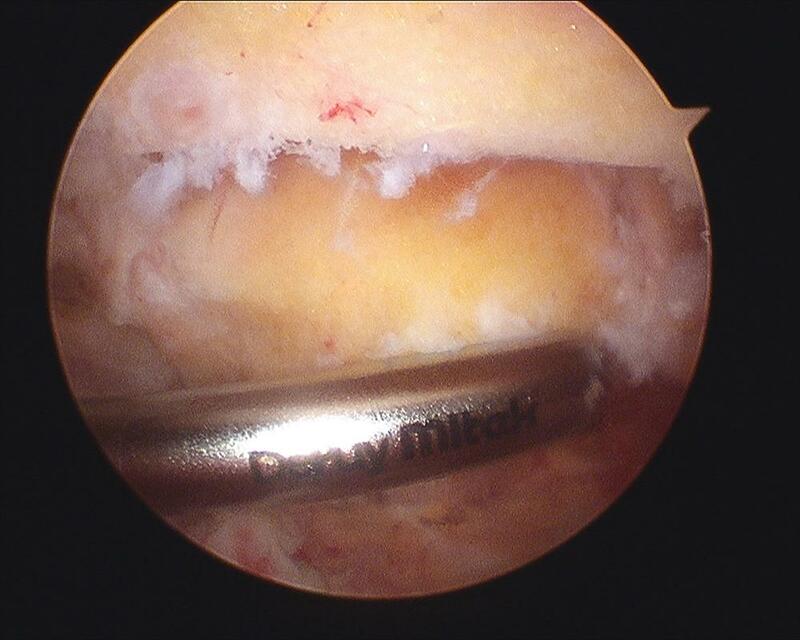 If the above treatments are ineffective or only provide short term relief then surgery in the form of an Arthroscopic Acromio-clavicular Joint Excision can be performed, often at the same time as subacromial decompression. This is key hole surgery and a burr (small rotating saw blade) is passed through the joint to widen the gap. The joint still moves and performs its function but the ends will no longer rub together, thus reducing your pain. You will be given a sling after the procedure which you can discard when you are comfortable but you’ll probably appreciate it for 2 to 3 weeks. Initially you can remove the sling for washing and dressing and choose whether you wear it during the night in bed. You can gently move your shoulder out of the sling when you feel comfortable to do so. Even if your shoulder is painful, you should keep your hand, wrist and elbow moving so that you do not develop stiffness in these joints. You cannot drive until normal mobility below shoulder height returns in your arm. Most patients symptoms settle down within 6 to 12 weeks of the operation. The AC joint is loaded heavily in overhead activities. Therefore in athletes (especially weight-lifters) or in heavy manual labourers, the AC joint may be overloaded leading either to damage to the cartilage within the joint or osteolysis (absorption of the bone) of the end of the clavicle (collar bone). Osteolysis is rare but is essentially a stress fracture (small break) of the outer end of the clavicle where the bone has been repeatedly overloaded exceeding the ability of the bone to heal sufficiently between injuries. This tends to affect a younger age group (< 40 years) than AC joint arthritis. You may feel pain on the top of the shoulder, localised to the AC joint and have pain on activity and on sleeping on that side. 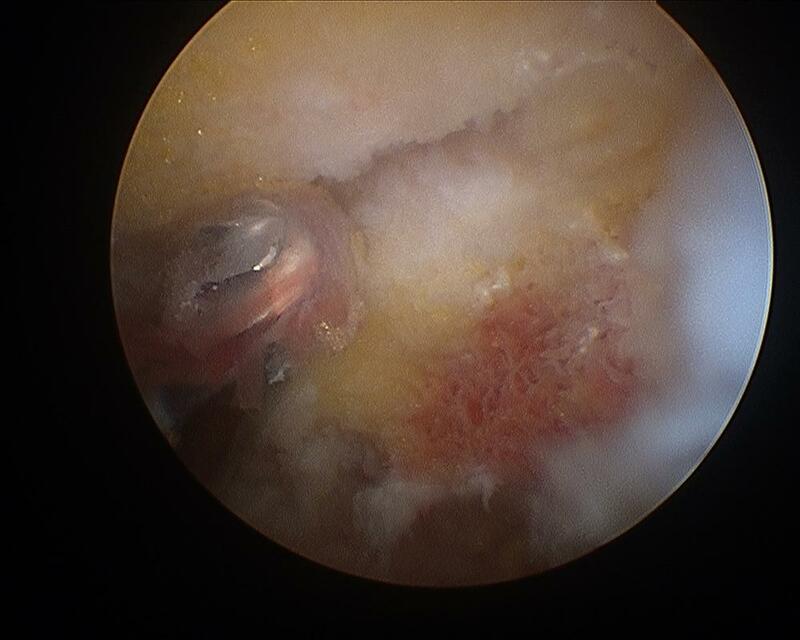 On examination, pain with direct pressure over the joint will often bring on the symptoms. Also, the Scarf Test may be positive. This is where the arm is brought across the chest as if putting your hand on your other shoulder. On plain X-ray there may be a loss of bone (osteolysis) from the outer end of the clavicle. MRI may show swelling and inflammation around AC joint. The symptoms may resolve with rest alone. 6-8 weeks complete rest from overhead weightlifting or heavy manual labour over shoulder-height is required to allow the bone to heal.